I am a self taught Cuban Artist. I have been influenced by a variety of classical, modern, and contemporary masters. My style has evolved from formal Realism, using pastels and oil paints to depict people and common objects, to a more painterly style, using a wider array of colors. Currently, my abstract paintings consist of, surreal imagery combined with geometric compositional elements. Furthermore, I use mixed media, oil and acrylic paints, Conte Crayon, collage, and found objects, to enhance the visual and textural aspects of my paintings. The subject matter and overall style of my work, has also been influenced by the psychological impact of my immigration from Cuba at the age of 5. Indeed, this unsettling transition is symbolized by the ethereal and often fragmented nature of many of the images I paint. Moreover, since my life changing accident in the year 2001, resulting in permanent nerve damage to my arm and hand, I was forced to prematurely retire from my occupation as a full time Dermatologist. 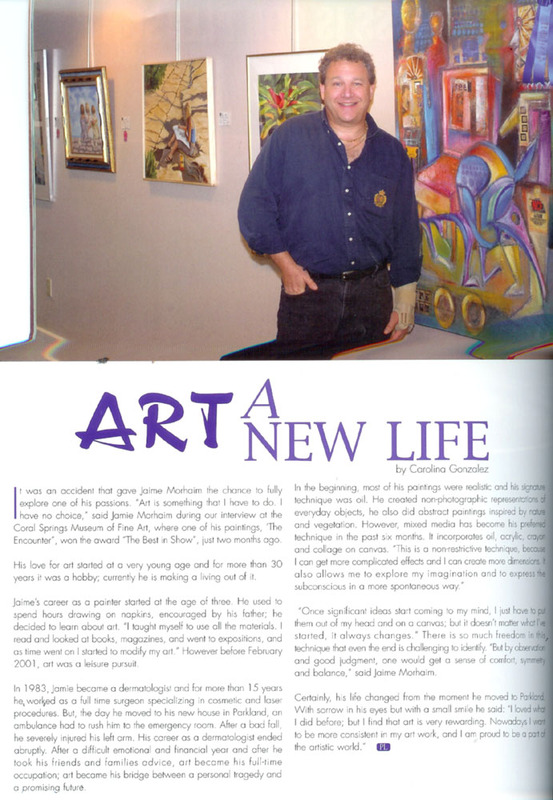 Thus, art was no longer a hobby; it became an integral component of my life. I paint daily and involve myself in various art related activities. As an Artist Facilitator for The Arts In Medicine Program of The University of Miami School Of Medicine, for example, I have been able to use my combined expertise in art and medicine, to help enhance the lives of both medical students and cancer patients.